The report’s introduction shares the facts and hope: “Between 2011 and 2015, foundations nationwide invested 56 cents per person in the South for every dollar per person they invested nationally. And they provided 11 cents per person for structural change work in the South for every dollar per person nationally. It is hard for Southern leaders, especially those at the vanguard of social change work in their communities, to reconcile the reality of a region full of innovative and effective social change networks with the long-standing dearth of resources to support their work.The soil for growing exciting solutions to national problems is deep and fertile in the South; the seeds are present, and foundation staff haven’t turned on the water. It’s time to open the spigot. Grantmakers and donors across the country are looking for ways to improve opportunities, outcomes and well-being of communities of color, the poor, LGBTQIA people, the disabled and others in the margins. There’s a region that provides inspiration and a place to start meaningful philanthropic giving with national impact. The American South has leaders and grassroots organizations that know how to fight regressive and divisive policies and practices that are marginalizing communities in the region and beyond. And yet, grantmakers have invested only 56 cents per person in the South for every $1 nationally. 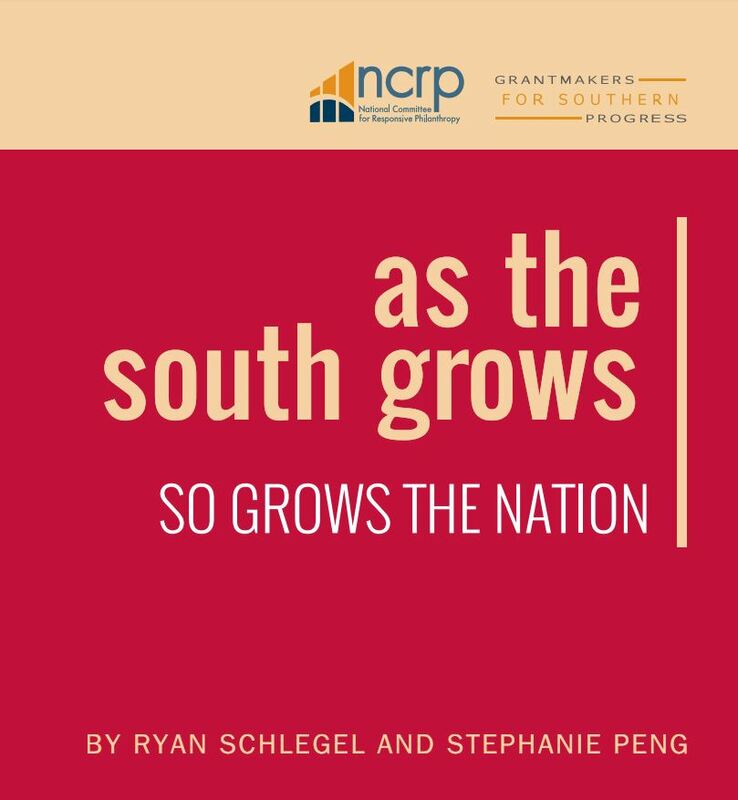 “As the South Grows: So Grows the Nation,” a new report from the National Committee for Responsive Philanthropy (NCRP; www.ncrp.org) and Grantmakers for Southern Progress (GSP; http://www.nfg.org/as_the_south_grows) highlights why it’s important for funders – from within and outside the region – to begin or increase giving in the South and how they can do so in ways that produce lasting, positive impact in the South and nationally. How should Southern grantmaking work? NCRP’s researchers spent two years examining philanthropy in the South and concluded that the grantmaking process used by funders typically puts Southern organizations at a disadvantage. Foundations and other donors who want to support real change in the South must fundamentally change the way they make decisions regarding who receives a grant, what activities to support and how. Weigh the stakes of the status quo and risk its privilege. Recognize and honor Southern capacity. They provide practical tips for funders on how to operationalize these three steps. Foundation staff and trustees – both national and those from the South – have a history of failing to trust Southern grassroots leadership. This is especially true when the leaders are women – particularly Black women – people of color, poor people, LGBTQ people and immigrants.Meanwhile, Southern grassroots leaders often do not trust funders even when their intentions are pure. To repair these broken relationships, grantmakers need to find out what’s broken, center relationship-building in their grantmaking strategies, and shift power and resources to Southern leadership. And by repairing these relationships, foundations and nonprofits from across the country can learn from a Southern ecosystem where it is the norm is to organize marginalized people across gender, class, race and other identities. What can grantmakers do now? While repairing relationships may take some time, there are still steps grantmakers and other donors can take to jump-start high-impact Southern grantmaking.Schlegel and Peng lay out eight actions funders can do right now, including investing in grassroots civic engagement infrastructure, taking more risk and hiring Southerners. “As the South Grows: So Grows the Nation” offers practical tips and resources that will help grantmakers and donors to have positive lasting impact on issues and communities they care about. The report, as well as the first four in the series, “On Fertile Soil,” “Strong Roots,” “Weathering the Storm” and “Bearing Fruit,” is available for free on www.ncrp.org.